The most acclaimed new interpreter of French cuisine since Alice Waters shares the techniques and the philosophy behind her award-winning approach to French food. With Debra Ponzek as their guide, a new generation of home cooks can truly participate in the next wave of culinary innovation. 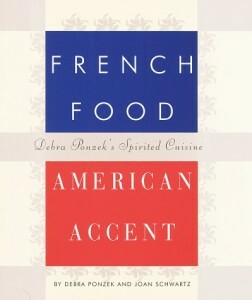 Debra Ponzek, former chef at Montrachet in New York, was once one of America’s superstar culinary artists. But she chucked it all to lead a more normal life away from the pressure and the long, hard hours. Now she’s back with a cookbook that draws on the expertise she gained in the kitchen of one of the top restaurants in the country. Her goal is to show how to apply some of the secrets of the chef’s art in your kitchen at home. Crab cakes, for example, can be cooked most of the way through in advance and finished off before serving. Broths can be made way in advance. The book succeeds, both in passing on tricks of the trade and offering delicious, inspiring recipes.